I went and bought some glow in the dark paint ... it works a treat, its very neat, but I can't photograph it to save my life. This is the first of many glow in the dark Skull Head Zombie Cats. 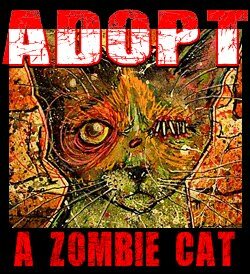 All zombie cats are up for adoption, inquire if you are interested in owning one. This paticular skull head zombie cat is available here.